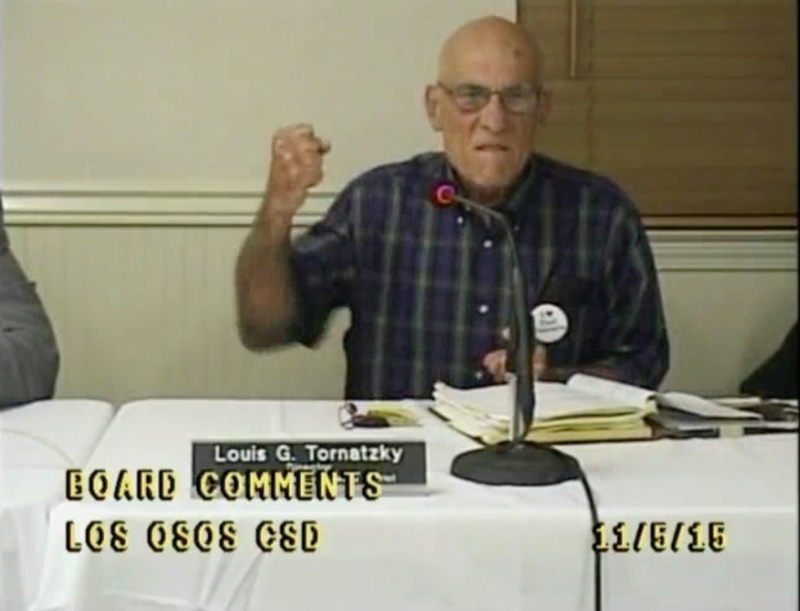 Shortly after agreeing to the League of Women Voters’ civility pledge, Los Osos Community Services District Board member Lou Tornatzky mouthed a slur at an audience member, video shows. On Nov. 5, the Los Osos board heard a presentation from the League of Women Voters and then adopted a resolution on civility and civil discourse at public meetings. Later in the meeting, during directors’ comments, Tornatzky applauded the resolution and then ranted at the public for their criticisms of district staff and officials. “I also saw the back and forth of our interaction here falling back into something that was really kind of crummy — people prefacing their comments with some slam for the manager or the directors or whomever,” Tornatzky said. Tornatzky then paused, pointed at an audience member, raised his fist and mouthed a slur. Audience members said Tornatzky mouthed the words f*** you. Tornatzky has regularly voiced support for Kathy Kivley, the district’s general manager, and disapproval for members of the public who question Kivley’s management of the district. In response to public commenters asking for Kivley’s firing, Tornatzky often responds angrily. Los Osos CSD meetings have long been contentious. The tension at meetings has increased recently as Kivley has come under fire for allegedly misappropriating district funds. Sounds more like Tourettesky than Tornatzky. Talk about trying to make something out of nothing. I just watched it and this guy was very controlled and trying to talk about civility when someone interrupted him. And he didn’t say anything. He just made a face. And the person interrupting him wouldn’t stop and had to be reprimanded by whoever was running the meeting. And this guy just gave up. He didn’t rant or rave or do anything. There’s nothing here to see folks. Move along. Stop. I’m dizzy already from your spin.